Today, I experienced my first major earthquake. 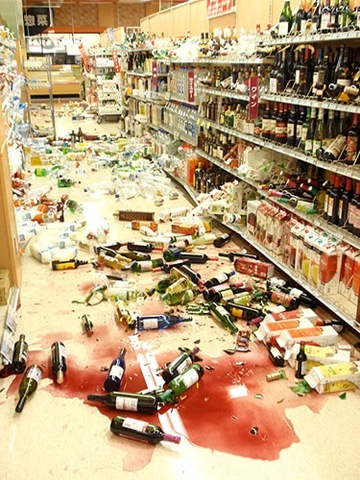 It occurred in Shizuoka, and while I don’t know where that is in Japan it was strong enough to register as 6.5 and to seem pretty darn scary when it struck at 5am this morning. My phone, which has an earthquake alarm mailing system, sent me an email notifying me of the earthquake just seconds before it struck. My phone then sends off a special alarm, notifying me of my potentially impending doom. I, ironically, had my phone on silent mode. So, when my phone began to madly vibrate at 5am in the morning I angrily went over and picked it up, wondering why on earth somebody was texting me at such an early hour. Then the whole house began to shake violently side to side and I thought I was going to die and when it all ended I fell back asleep because it was frankly 5 o’clock in the morning and when I’m tired, for all I care the tripods could be invading and I’d still rather just go back to bed. Now, had I not been in my home, sleeping, when the earthquake went off and had I been in, say, a crowded train traveling beneath Tokyo, I probably would’ve been freaking out when my phone alarm went off and said “You’re about to be hit by an earthquake. Take cover”.